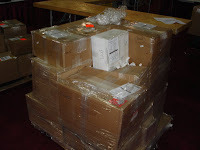 Beaducation: The Blog: Bead & Button 2009...We sent how many boxes??? and now we have to set up a tripple booth??? 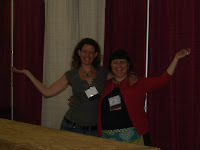 Bead & Button 2009...We sent how many boxes??? 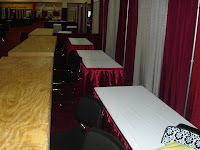 and now we have to set up a tripple booth??? Lisa had a class (two classes), Liz Jones had a class, we were expecting Kriss and Mindy to fly in from San Francisco, Colin just drove 12 hours, Lisa and I been up since 7 AM (which is 5 AM our regular time) AND we had gotten to bed late after having a lovely dinner with one of our suppliers (that might have involved wine; we will neither confirm or deny). No problem. We can handle it. We are BEADUCATION!!! 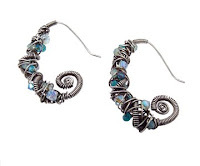 Lisa got to her class in plenty of time, set up, handed out kits and rocked the house with her Stamped Ladder Bracelet and Tornado Earrings classes. Colin and Liz went to check in and grab their teaching materials while I attended to some office business. I was to meet Colin at noon for set-up, so I high-tailed it up to the showroom floor at about 12:30...(so much for punctuality, but I'm on bead-time) and was greeted by the huge banner that welcomed up all to Bead & Button 2009. I began to feel overwhelmed. It was a darn big sign. Now, to unpack and make everything look GREAT! 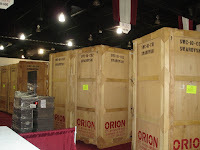 At least our boxes weren't as big and daunting as the ones from Swarovski around the corner. Unearthed Box number 13 that contained the box cutters and got to work. Break at 6:30...Breathe a sigh a relief when Mindy and Kriss arrive. Lisa and Liz taught great classes and now on to "Meet the Teachers"....We will catch you up with those shenanigans next time.